We heard from our customers that they wanted an even simpler onboarding experience to Azure Security Center. Today, we are excited to announce the general availability of Azure Security Center’s Cross Subscription Workspace Selection. This capability allows you to collect and monitor data in one location from virtual machines that run in different workspaces, subscriptions, and run queries. When first onboarding to Azure Security Center, you’ll need to start in our Data Collection tab to provision a monitoring agent onto Azure. The agent will allow you to monitor the security state of your hybrid cloud resources. As virtual machines are being spun up and down, and workload owners across your organization are creating new workloads and resources, you need to make sure these are protected at the time they are created. By default, we put the data that the monitoring agent collects in a Log Analytics workspace, but we give you the flexibility to use another workspace if you are using it already for other management functions. Today, when you select a workspace for your data to reside in, you’ll see all the workspaces across all your subscriptions available. Cross Subscription Workspace Selection allows you to collect data from virtual machines running in different subscriptions and store it in the workspace of your choice. This capability works for both virtual machines running on Linux and Windows. 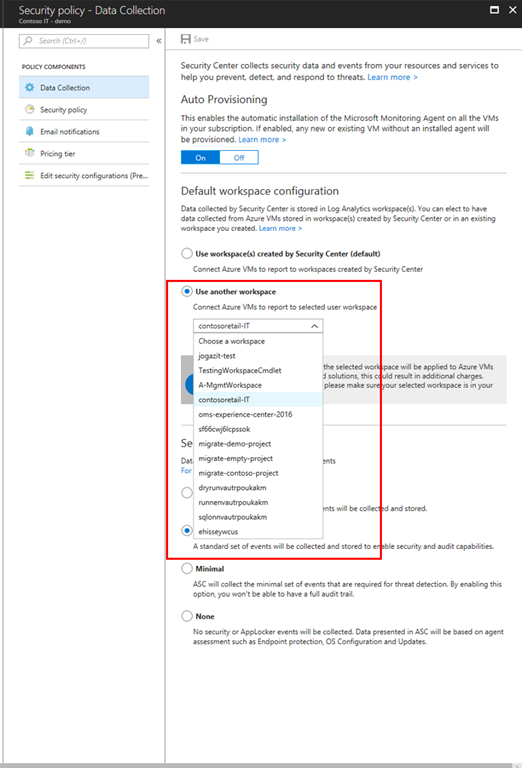 Cross Subscription Workspace Selection a part of Azure Security Center’s Free Tier, making it easy for you to get started today. To learn more about how to set up this capability and other Azure Security Center features, visit our documentation. For any feedback or additional information contact ASC_Onboarding@microsoft.com.